Gerontology concerns itself with the study and application of knowledge about the physical, social, and economic conditions of older people. Since the process of aging touches all aspects of human activity, gerontology is multidisciplinary in nature. Gerontology is becoming a major area of research in the biological, behavioral, and social sciences. Gerontological training and research is an important link in meeting the social, physical, and psychological needs of the elderly. Students of gerontology benefit through the personal understanding of their own aging process. Those wishing to pursue careers in aging will find many exciting opportunities for serving the elderly in a variety of settings. 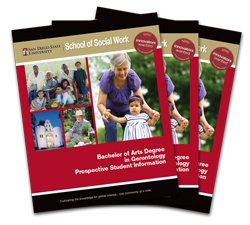 One of the primary goals of the gerontology program is to provide students with a broad base for comprehensive understanding of the impact of society’s changing demographics on every aspect of their social and work lives. It is through research, teaching, and community involvement that faculty members from numerous disciplines provide for the intellectual development of students, the enhancement of community programs, and the assurance of a better quality of life for older people in the community, the state, and the nation.